Many people shop at Costco because they want good value on the more than 3,700 items in stock. Yet few people know just how Costco is able to give its customers such quality and value, or what makes Costco different from other wholesale companies. We spoke with regular Costco (COST) shoppers -- or members, as the company calls them -- as well as with Costco executives and retail analysts to get the inside story on what attracts 72 million Costco members and $103 billion in sales per year. If you want brand names for less, you'll find them here. Costco is a source for brand-name merchandise but the store doesn't tell you which designer brands they carry because brands vary and the designers don't want that information revealed. "We sell high-end items at a great value or at a great price," says Jeff Elliott, assistant vice president, finance and investor relations for Costco. "We're not a fashion retailer. We're a general merchandise retailer, generally basics. It could be the latest merchandise but we're in the basics business." Apparel is a risky category, he adds, so fashion is not Costco's focus. That doesn't mean you can't find better brands of winter boots, for example, or leather jackets. When you go abroad, you can still shop. Costco warehouses are located in the U.S., Canada, Mexico, the U.K., Korea, Japan, Taiwan and Australia. The company plans to open in Spain in the spring of 2014. Merchandise varies regionally. "We have buying offices in each region," Elliott says. For example, if there is a salsa manufacturer in a particular place, Costco aims to carry that item for that region, he says. Quality at the lowest possible price means value. Costco aims to sell quality merchandise at the lowest possible price, and "we call that value," Elliott says. "The way we do that is we buy in bulk and keep overhead low." In the marketplace, food items, for example, are typically marked up 20 to 30 percent, Elliott explains. "On average, our typical markup is 10 percent." %VIRTUAL-article-sponsoredlinks%The way Costco marks up less than others is because they have lower overhead using the warehouse model to sell their goods from the shipping pallets rather than unloading items, opening boxes and stacking items on shelves. "We drop a pallet on the floor," Elliott says, and it's typically a concrete floor. "The whole concept is based on volume. The more volume we can do the more we can save our customers." If you buy an item by mistake, you can bring it back for a cash refund. Costco ranks number one among stores with the best return policies, according to the website, gobankingrates.com, which ranked stores in December for return policies just after the holidays. Second was Nordstrom (JWN) and third was Zappos, owned by Amazon.com (AMZN). Costco member Joan Silver of Fairfax, Va., described how she was able to return a case of yogurt to Costco within days of purchasing it because it was not the kind she had intended to buy. She said she also has returned jeans that didn't wear well. "We know who you are if you're a member of Costco," Elliott says. If Costco has a recall on any of its merchandise, someone from the store can call customers who purchased the item. "We can just look it up," he says. Refunds are made in cash or back to the customer's American Express (AXP) credit card, which is the only type of credit card that Costco accepts. (It also accept cash, checks and debit cards.). "Whatever the customer wants is what we want to do," Elliott says. Kirkland is made for Costco. 20 percent of all the items in a Costco warehouse are sold under the name Kirkland. All kinds of manufacturers make these products for Costco. Kirkland items range from two loaves of bread separately packaged and then packaged together in a plastic bag to a package of three pounds of raw almonds. Food is key. "Food is your traffic driver," Elliott says. Typically, shoppers head to Costco for basic food items, then walk by the apparel area, and see a designer brand shirt for $29.99 that sells in other stores for $59.99, or they browse in electronics and find a TV that usually costs $2,400 for $1,900. From fresh and packaged foods, sundries, electronics, sporting goods, hardware and automobiles to apparel, luggage, housewares, linens, and travel, Costco sells most product lines including items like high-end jewelry, men's suits and cosmetics. Hot dog and soda is a winning combination. Costco sells 109 million hot dog and soda pop combinations worldwide per year at $1.50 for the combination of the two items. The details: Each hot dog is more than a quarter pound and the hot dog and soda pop combination have been sold in all Costco locations since its founding in 1983. 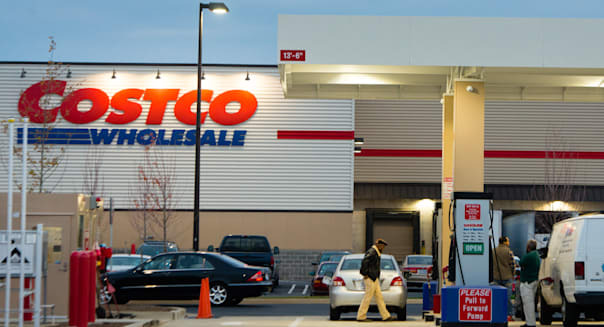 The 72 million members of Costco attest to the popularity of the international wholesale store. Whatever you need, Costco aims to have it at good value -- quality at the lowest price. Sometimes they carry special items for a certain period of time. "It creates what we call the treasure hunt," Elliott says. Anything a store really wants customers to buy is placed at eye level. Particularly favored items are highlighted at the ends of aisles. Color affects shoppers, too. People are drawn into stores by warm hues like reds, oranges, and yellows, but once inside cool colors like blues and greens encourage them to spend more. Finally, there is the ubiquitous "valued shopper" card. This card gives you an occasional deal in exchange for your customer loyalty and valuable personal data.